Advocacy starts at any age! Kids can get involved with our Student Service Clubs. Thank you for wanting to share your time and passion in helping animals and people in our community! Our on-campus Youth Opportunities working directly at the shelter are for students 5th grade and above. We also host humane birthday parties for younger students, along with shelter tours on our campus and humane education lessons presented in schools. We are now accepting applications for Fall 2019 clubs with meetings from September – December 2019. Applications for the Fall 2019 clubs are due by August 21, 2019. Applications received by the deadline will be reviewed and applicants will be contacted by August 24, 2019. 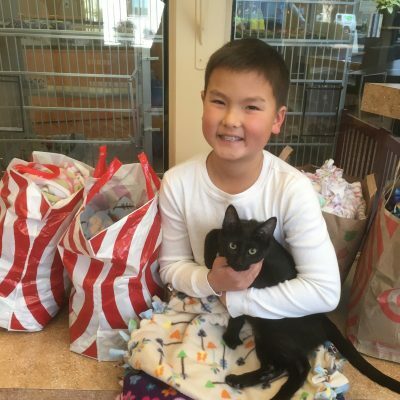 If you’re in need of community service hours for your school, please consider completing an independent project to help the animals at Marin Humane. Check out our Compassion In Action page for information on independent projects and get your photo added to the page after you complete your project. Our student service clubs bring students to our campus to give them a forum to help animals and support our mission. The clubs are a semester long and require an application, activity fee ($50), and training. Each club has 12 members per semester and meet every other week. If necessary, a lottery is used to choose members. Animal Care Club introduces students to Marin Humane’s programs, the workings of an animal shelter, and humane issues. Each meeting involves a project and animal time. The club meets every other week on Thursdays for one semester. To apply to be one of the 12 members of the Animal Care Club, please download the application! As part of a global youth community service project started by Dr. Jane Goodall, our Roots & Shoots clubs work on projects to help animals and the environment in Marin County and beyond. The club meets every other week after school and is one semester long. Junior Roots & Shoots meets on Thursdays and Senior Roots & Shoots meets on Tuesdays. To apply to be one of the 12 members of either the Junior or Senior club, please download the application! Our Student Advocates Club is for students who’ve completed a semester of our Roots & Shoots club and want to continue helping animals and the environment in Marin County and beyond. The club will focus on advocacy goals related to Marin Humane’s work and the students’ interests and passions. The club meets once a month on Wednesdays for one semester. To apply for Student Advocates Club, please download the application! Student Interns are able to learn first hand by working in a variety of departments at Marin Humane. This opportunity allows them to be a part of our work and prepares them to become student volunteers. Interns also pick a specific humane issue they’re passionate about, create a research paper on the subject, and present their findings to the intern group. Internships are a semester long and require an application, activity fee, and training. Student Internship applications are available upon request to eligible students. Please request an application by emailing the Humane Education Department. After completing a Student Internship, there are special ongoing student volunteer opportunities available in a variety of departments at Marin Humane. Student Volunteer assignments will depend on departmental needs. All of the above programs can count towards community service hours for school requirements. For more information please contact the Humane Education Department.